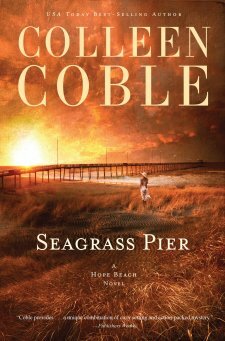 Seagrass Pier is the third novel in Colleen Coble’s Hope Beach Series. Although it is in a series, it definitely stands alone. I did not feel as though I was missing pieces to the plot because I had not read the prior two books. This story is full of suspense, subtle romance, and some creepy characters. Warning to the easily frightened, this is no bedtime story! I was truly surprised by my desire to hide under the covers after some of the chapters in this book! I don’t normally read murder mysteries, but the story line and geographical location alone made me want to read it. In this book, recently widowed Erin Summerall is recovering from a heart transplant. While she is grateful for her life, she is uneasy about the nightmares that came with it. The donor was murdered and Erin is seeing life through her eyes. An old friend, and true father of her daughter is a FBI agent who has a vested interest in the case. Together they work to find the murder before it’s too late. What I love about the story is the high level of suspense and unexpected turns. I was certain I knew who the murderer was, but I was wrong. I am never wrong. There were a few elements to this book I struggled with as I got further along in the story. For instance, so many characters are introduced, so much information is given, and a few too many plot lines exist for my taste. While the side stories are interesting, I found them to be too much. The good news is, if you love murder mysteries with a side of love, you will likely enjoy this book. I was given a complimentary copy of this book in exchange for an honest review from BookLookBloggers and the book’s publisher. All opinions are my own.